The industry continues to consolidate, with HEXO Corp (TSX: HEXO) (NYSE American: HEXO) announcing the pending acquisition of Newstrike Brands (TSXV: HIP) (OTC: NWKRF), a merger of two companies generating substantial revenue. Aurora Cannabis (TSX: ACB) (NYSE: ACB) sparked a rally following its bring on Nelson Peltz as an adviser with a large options package. 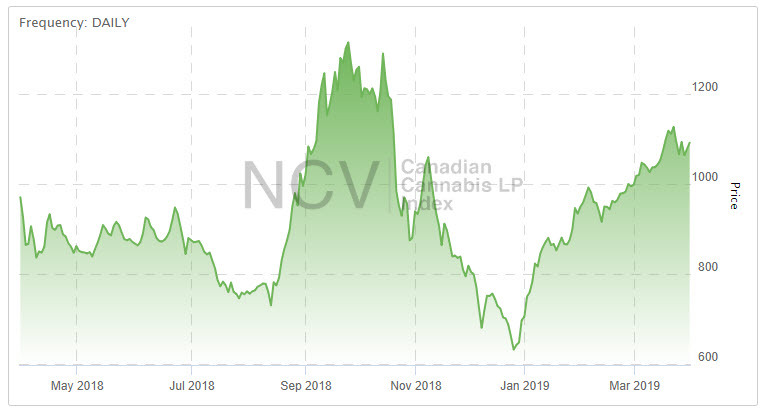 The index, which included 49 publicly-traded licensed producers that traded in Canada at the end of February, with equal weighting, is rebalanced monthly. 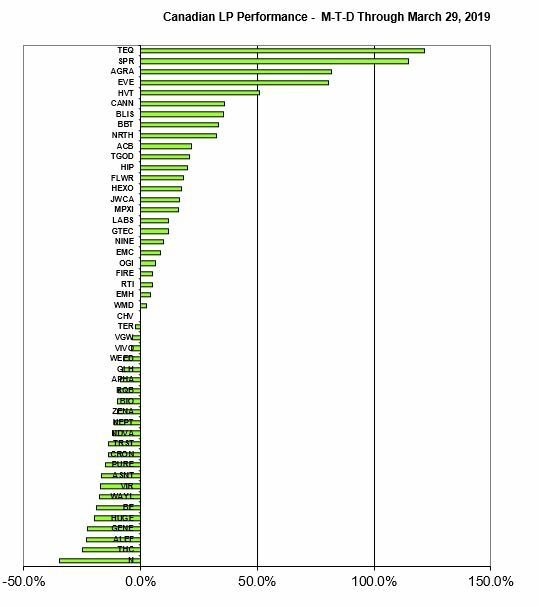 Each of the members is also included in a sub-index, with four in the Canadian Cannabis LP Tier 1 Index five in the Canadian Cannabis LP Tier 2 Index and 36 in the Canadian Cannabis LP Tier 3 Index during the month. Emblem was removed mid-month from the overall index and the Tier 3 index following its acquisition. Tier 1, which included the LPs that are generating sales of at least C$10 million per quarter (in 2018, we used C$4 million as the hurdle), cooled off in March, declining 0.3%, giving it a year-to-date gain of 68.0% after declining 7.7% in 2018. This group included Aphria (TSX: APHA) (NYSE: APHA), Aurora Cannabis, CannTrust (TSX: TRST) (OTC: CNTTF), Canopy Growth (TSX: WEED) (NYSE: CGC) and Organigram (TSXV: OGI) (OTC: OGRMF) . Within the group, Aurora Cannabis stood out with a gain of 21.9%, while CannTrust was the worst performer, declining 13.8% following disappointing financials for Q4. Tier 2, which included the remaining LPs that generate quarterly sales between C$2.5 million and C$10 million, rose 7.2%, leaving it up 68.3% to begin 2019 after declining 35.0% in 2018. This group included Cronos Group (TSX: CRON) (NASDAQ: CRON), HEXO Corp, Newstrike Brands, and Supreme Cannabis (TSX: FIRE) (OTC: SPRWF). 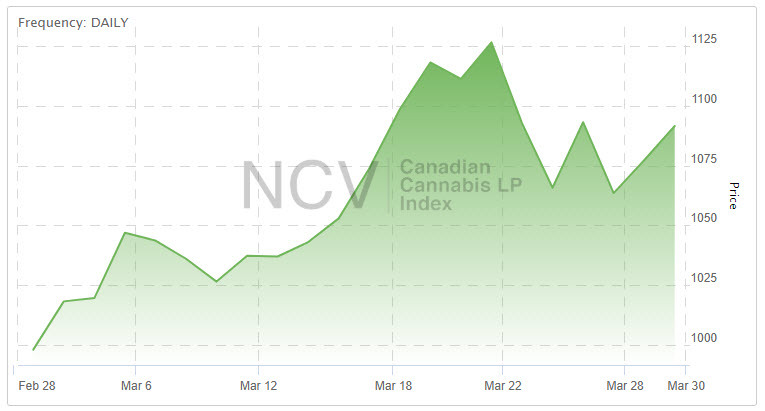 Newstrike, at up 20.0%, and HEXO Corp, at up 17.4%, led the way, while Cronos Group fell 13.9%. Tier 3, which included the 40 LPs that generate quarterly sales less than C$2.5 million, rose 10.8%, leaving its year-to-date gain at 50.8% after declining 26.4% in 2018. The best performers in the group were Terranueva (CSE: TEQ), Sproutly (CSE: SPR) (OTC: SRUTF), AgraFlora Organics (CSE: AGRA) (OTC: PUFXF), Eve & Co (TSXV: EVE) (OTC: EEVVF) and Harvest One Cannabis (TSXV: HVT) (OTC: HRVOF). Terranueva, based in Quebec, was added last month. Sproutly reported that it is in talks with a beverage company. AgraFlora, which has seen substantial insider selling, has raised capital recently, issuing almost 45 million shares to Organic Flower Investments Group for $20 million. Eve & Company was able to secure a construction loan from a Tier 1 bank. Harvest One expanded its distribution, including with Shoppers Drug Mart, and announced the pending acquisition of Delivra. The 10 worst performers for the month were part of Tier 3. For April, the overall index had one addition, Rubicon Organics (CSE: ROMJ) (OTC: ROMJF) joining in Tier 3. Additionally, we have removed Ascent Industries (CSE: ASNT) (OTC: PGTMF) due to its pending sale of its Canadian operations. Additionally, HEXO Corp advances to Tier 1 this month. Readers should be aware that Tilray, with no Canadian listing, is not eligible for inclusion in the index, which is denominated in Canadian dollars. In the next monthly review, we will summarize the performance for April and discuss any additions or deletions. Be sure to bookmark the pages to stay current on LP stock price movements within the day or from day-to-day.